I hadn’t looked at crude oil in a very long time so I figured I’d take a crack at it. Nominal model, peaks and troughs. Phases like stocks. Works very well back to at least 1994 but I had to jocky the starting date of my analysis due to somewhat limited data. I don’t believe the magnitude of the bounce coming out of this 80w low but we’ll see. Need more data for a better long term picture. Long term FLDs (not shown) don’t seem to help me much here unless they will act as resistance in the future. There is a big projected low in 2020 like stocks. Monthly back to 1986 (log scale). Yeah, there’s a lot more downside. Very nice Curt. I am keeping a close eye on Oil for the 80w low and my phasing for the duration is similar to yours. Longer term remains to be seen! Curt, where did you get your data? My data only goes back to 2010. Thanks for the post. 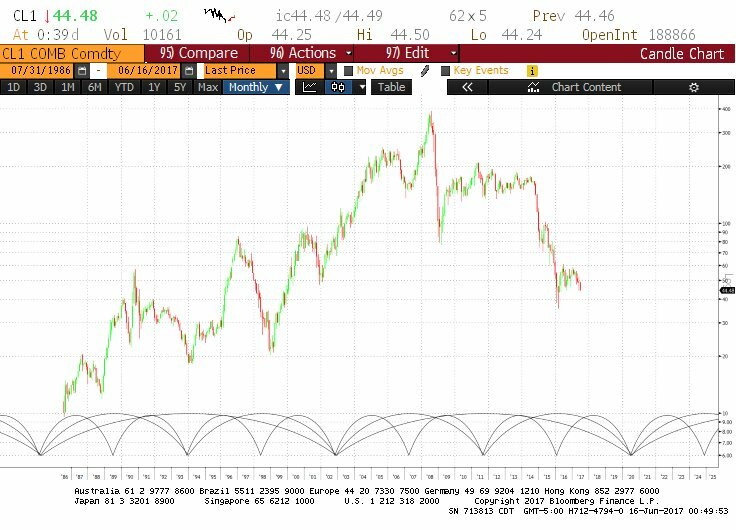 It is generic front month WTI futures from Bloomberg. It looks like I could’ve cleaned up the short term picture with a little pinning but didn’t bother since I don’t plan on getting involved in the near future. What’s interesting to me is the daily commonality in directional movement between crude and stocks, with crude (and other economically sensitive commodities) having much more downside recently. This has been the case for some time but it’s a good reminder of how some markets lead.